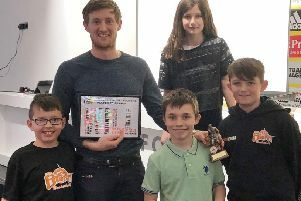 There was yet more success for Berkhamsted & Hemel Hempstead Hockey Club at the weekend as three further promotions were secured – taking the club’s tally to four for the season. The club’s table topping challengers, including the men’s first team, all enjoyed key victories to ensure that they followed in the footsteps of the men’s seconds by securing their place in a higher division next season. And the success may not be over – the men’s fourths face a showdown with Rickmansworth next Saturday in a winner-takes-all promotion clash. The men’s first XI faced a tricky final game of the season against Bishop’s Stortford on Saturday – an opposition who have always made life difficult over the years. This game was no different, however goals from James Barron and Pete Allam were enough to earn an all-important 2-1 win and secure the championship. Elsewhere, the men’s seconds had a feisty game against Royston but showed their grit to run out comfortable 5-2 winners, while the men’s thirds recorded a straightforward 5-0 win over St Albans in their final game of the season. The men’s fourth XI were outstanding at Broxbourne and came away with a 7-1 victory that included a hat-trick from Jeremy Steed – taking them into the season decider against Rickmansworth. The men’s fifths went down 3-0 against West Herts, but it was much better news for the ladies’ second XI who did what they needed to do to confirm their promotion. A 5-0 win against Chiltern means they need one more win to be crowned champions, with a big game coming up on Saturday against Saffron Walden. Meanwhile, the ladies’ firsts finished their season with a narrow 1-0 defeat against Letchworth.